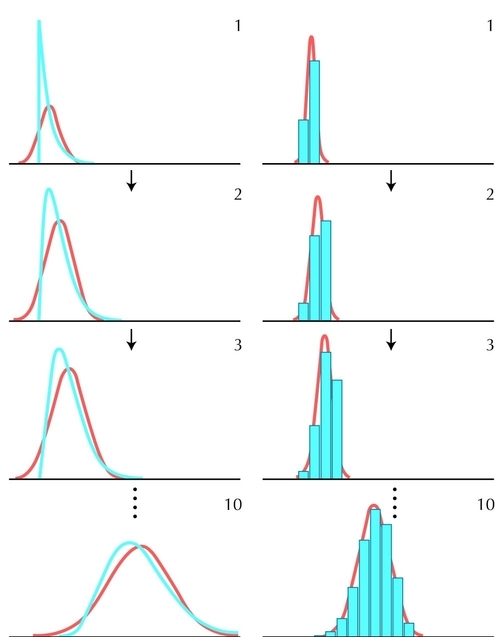 Chapter 28: Models of Evolution: Figure 28.24 - The distribution of the sum of several independent random variables converges to a normal (i.e., Gaussian) distribution. Figure 28.24. The distribution of the sum of several independent random variables converges to a normal (i.e., Gaussian) distribution. (Top left panel) Exponential distribution (blue) together with a Gaussian distribution with the same mean and variance (red). (Left column) The blue curves show the distribution of the sum of 2, 3, ..., 10 exponentially distributed variables. (Right column) The same, but for a two-valued discrete distribution. In both cases, the distribution of ten independent variables fits well to a Gaussian curve.